It’s pretty clear just how important it is to have a library within your classroom. In fact, our main focus of Episode #2 was all about why your students need that vibrant classroom library. But I will admit that I’ve made some major mistakes that really limited how effective my classroom could be. In fact – when I went to go list them all, it ended being too much for one episode. So this one will be a two-parter. And if you are a librarian or parent listening today, there’s still a lot you can take away from today’s topic when thinking about your books and other materials you have for your kids. So here are six common mistakes that teachers sometimes make with their classroom libraries – and some ideas on how to fix them. This took me so long to learn. It literally still PAINS me to even think about just throwing away a book. But about a year ago, I started to notice that copies of old, yellowed, dusty titles with ripped pages and outdated cover art were taking up a lot of precious real estate in my class. And for no reason – they were NEVER getting checked out. They just didn’t have any curb appeal. And they were bringing down the overall vibe of our library. So give yourself permission to purge. Finally just last year I let myself take the 12 tattered copies of The Voyages of Dr. Doolittle and those other musty old books and box them up and put them away. And I truly felt guilty about that. Some were donations from parents or other teachers. It’s okay to recycle them. I’ve tried just about every system on the block – from a simple form on a clipboard for name, date and title to using the Booksource App where students scan the barcode on the book to check out and then check it in. But eventually I found that even the seemingly quick and simple act of writing down their name and the title of the book was slowing down that free exchange of books and had the unintended effect of kids not wanting to check books out of the library because it was too cumbersome. Also – it added a small element of tension when kids would forget to sign a book back in or keep it out too long. And I want the tone of our library to be all positive. I do know that many teachers are having success with quick procedures and systems to check out books. I just have never been able to make it work. So as much as I would love a beautifully ordered library where I know the whereabouts of every title – it’s more important to me that kids can swap books easily with each other and there’s no barrier to trying something. For example, just yesterday I pulled a stack of 5 books that Logan might like, set them on his desk, and he was free to browse them leisurely and bring one or two home to read. Do I have books Missing in Action? Yeah – you bet! But I’m willing to risk it so my students have more access to books. And they also really appreciate being trusted in that way. So for example, for months I had my bins of Realistic Fiction front and center in my classroom library. They were top shelf – most visible and most checked out. While my biographies and historical fiction languished on the bottom shelf. And I didn’t even think anything of it until I switched them on a whim one afternoon and noticed that – a ha! – more kids were taking out the biographies and historical fiction when they didn’t have to bend over to get them. Also – if you have your library organized by bins – another idea is to switch which title is in the front sometimes. I have to say – this has been a major error on my part, and I’m still working on fixing it. I tend love the story – a heartfelt narrative. And I didn’t intend to ignore non-fiction, I just had blinders on. But I’ve been hearing from a lot of other teachers who are in the same boat. So – I’ve made a conscious effort to get more informational books for my students and listen for topics they are interested in. The more I started to pay attention to non-fiction, the more I realized how many fantastic titles are out there now. And I made a deal with myself that I would get at least one non-fiction title every time I bought books. It’s tough to keep a classroom library organized – our days are hectic, and it’s all you can do sometimes to keep up with everything. But having some system in place is really key. Whether you alphabetize by author’s last name, sort by genre, or pick a different route – make sure your students know where to find things and also how to put them back. Another fantastic idea that I’ve seen is to get your students’ input about how to organize the classroom library and have them in charge of it. If you do that at the beginning of the year, what an amazing way to have them examine every book offered and take some ownership of it. When I first got my own classroom, I could not wait to stock it full of my own favorites from my childhood – Nancy Drew and Trixie Belden mysteries, all the Little House books, my extensive (and yellowed) collection of Baby-Sitters Club novels, and tons of Judy Blume and Beverly Cleary books. But honestly, the 6th graders I had at the time rarely checked them out. Instead – have your students help you. One thing I’ve seen teachers do is post a Wishlist on the wall next to your bookshelves so when students have an idea of a title you should have, they just jot it down. Then you can take that list with you when you’re headed to the bookstore or submitting your Scholastic order, and you KNOW you’re getting books they want to read. It also helps to simply listen when they rave about a favorite series or author so you can include those as you build your library. Making sure that the student’s choices are at the forefront really drives home the fact that this library is THEIRS – not all about you. And I think they’re more likely to get attached to that library when they know their voices are heard and their opinion matters. This is a big topic and we’ll continue it in the next episode. But for now, what classroom library mistakes have you made and more importantly – how did you go about fixing them? Let’s connect and learn from each other. You can tag me on Twitter or Instagram or email me at booksbetween@gmail.com and I’ll share some of your thoughts and ideas in an upcoming episode! In this segment, I share with you three books centered around a theme and discuss three things to love about each book. This week I’m sharing three delightfully spooky series: The Haunted Library, 43 Old Cemetery Road, and The Books of Elsewhere. Fun Glossary – At the front of the book is a one page list of really cute ghostly terms used in the novel. Again – this is a cute spooky and not a scary spooky book. For example, “skizzy” is when a ghost feels sick to their stomach – like when people walk through Kaz. At one point he even pukes on Claire! And “Solids” are what ghosts call living humans and animals and also objects they can’t see through. Illustrations – There are lots of black and white drawings throughout the book, and I love that vintage 50’s style that Aurore Damant has captured here. It fits the tone perfectly. Plus the little details of the dotted scrolls around each page number and the matching chapter headings add that special touch of ornamentation that makes you feel like you are reading something well put-together. The fun of figuring out the rules of the supernatural system in this series. That is part of what I think makes fantasy so fun to read because you have to figure out that world. Just like when I start a new vampire book and I ask myself, Okay – are these sparkle in the sun Twilight-type vampires or are they sizzle in the sun Sookie Stackhouse-type vampires? Or something entirely different? In The Haunted Library, we’re asking ourselves – Can the ghosts eat? Do they sleep? Can they make sounds that humans can hear? And most interestingly here – where do they come from? Typically, ghosts are presented as the souls of once living people, but in this world, they seem to have no memory of a past life and they have families with kids and grandparents. Almost like they are from another parallel dimension. There is SO much to explore in this series and so much get your kids wondering. 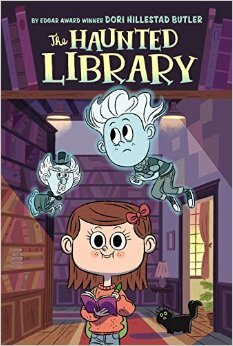 The Haunted Library is really cute and not too scary. At 125 pages with larger print, it’s perfect for younger middle grade readers or older kids who want something light and playful. And there are at least 8 in the series so there’s plenty of semi-spooky fun to look forward to. Character’s Names – The wordplay in these books are oh-so-clever – especially with the names of the characters. Grumply’s publisher is called Paige Turner, his real estate agent is Anita Sale, the young boy living in the house is Seymour Hope, and the ghost is Olive C. Spence. It’s just a really fun read. How letters and articles tell the story – The 43 Old Cemetery Road series is the perfect way to introduce your kid to the term “epistolary novel.” And boy do they get it right here. The letters from each character have their own clear tone and their own individual font. Your kids will love the articles and drawings that go with the letters and it’s a book that you can read quickly. The authors – Kate & Sarah Klise are sisters and have teamed up to write an impressive number of really fun books like The Three-Ring Rascals series and the Regarding series, which are also mysteries told in letter form. My students really got into exploring their website and blog last year where they share letters they get from fans and pictures from their travels. I just LOVE them – and they make such a great team. 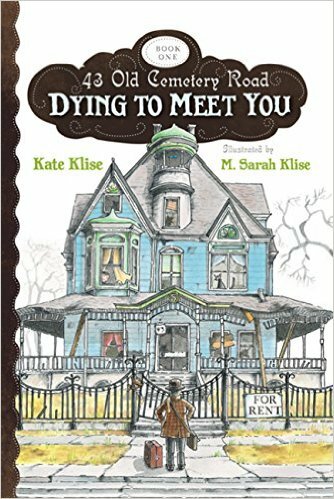 If you want to know more about the 43 Old Cemetery Road books, take a peek at their website kateandsarahklise.com. And I’ll pop a link to that right in the shownotes for you. The Cats – Like any great paranormal mystery, there are strange cats in this novel. In fact, I just realized that all the three books I’ve talked about today have cats in them. In this book – we get three: Horatio, Harvey, and Leopold. Olive first discovers that something is magical in this house when Horatio jumps through her bedroom window and has a conversation with her about being on her guard in the house. What I enjoyed the most about the cats were that you couldn’t tell whose side they were on. Morton – Morton is a young boy who Olive discovers hiding in one of the creepiest, darkest paintings in the house – the one big painting of the moonlight and dark forest. Morton is dressed in an old-fashioned white nightshirt and when Olives tries to ask him questions, he’s both confused and stubborn all at the same time. Eventually we piece together the clues about where (and when) he might have come from, and oh – poor Morton! The House – Much like Jason Segel and Kristin Miller’s book Nightmares and Clive Barker’s The Thief of Always, the house in this book seems to have its own personality. It’s beyond haunted and seems to try to lure Olive into its grasp. Like many old Victorian houses, this one has a terrifying basement. And a chilling secret. 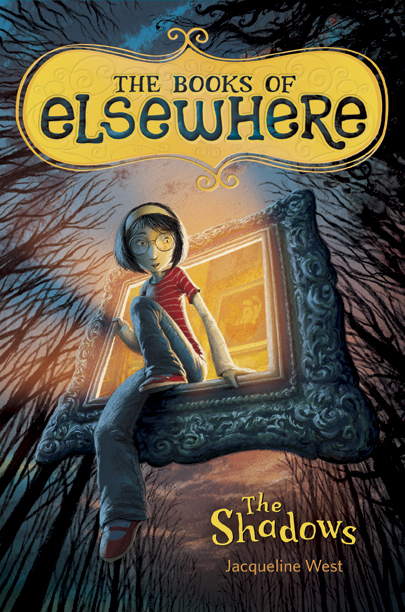 The Haunted Library, 43 Old Cemetery Road, and The Books of Elsewhere are three great paranormal series for getting into the perfect creepy mood – whether that’s in October or anytime of year. I am reading this out loud right now to my own 4th grader, and it has really held up well from my own memory of it. And I had totally forgotten that cool editor’s note at the beginning that says the manuscript was dropped off by a dog who claims to be the author. So now you have to wonder – is this dog really a reliable narrator or does he have his own agenda? I’ve talked about the Rip & Red series previously in Episode #4 but it is worth another plug. This book is fast-paced fun with likeable characters going through real-life school related stuff. I have no doubt 4th graders would love it. My third suggestion that would be a phenomenal 4th grade read aloud is Peter Brown’s The Wild Robot – It’s about a shipwrecked robot named Roz who gets washed up on the shore of an island inhabited only by animals. And she ends up caring for an orphaned gosling and making a mark on the island. It’s just so different than anything else out there and the small chapters work perfectly to read aloud during the small moments of your day. Plus – doing the voice of Roz is a riot. I had more fun reading this book out loud than any other novel I’ve ever read aloud. Those are my three suggestions for awesome 4th grade read alouds – Bunnicula, A Whole New Ballgame, and The Wild Robot. You can’t go wrong any of them! Alright – that’s it for the Q&A section this week. If you have a question about how to connect middle grade readers to books they’ll love or an idea about a topic we should cover, I really would love to hear from you. You can email me at booksbetween@gmail.com or message me on Twitter/Instagram at the handle @Books_Between. Thank you so much for joining me this week. You can get a full transcript of this show with links to every book and resource I talked about today by going to BooksBetween.com/9 which will take you to our home at All the Wonders where you can discover other wonderful kidlit resources. And, if you are liking the show, please help others find us too by telling a friend, sharing on social media or leaving a rating on iTunes or Stitcher. Thanks and see you in a couple of weeks! Bye! These are wonderful ideas. Thanks for sharing! I am also bad at recycling old texts. My fourth graders love The One and Only Ivan, The Lemonade War, How to Steal a Dog, and Holes.